Protect your athlete’s winning smile with a custom made mouthguard designed by the dentists at Longmeadow Family Dental. Protect your athlete’s winning smile with a custom made mouthguard. 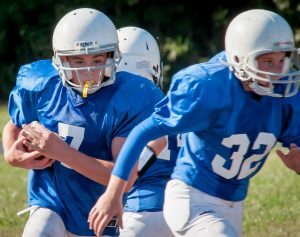 If your child plays a contact sport, common mouthguards cannot provide total protection from teeth and mouth injuries. The most commonly used mouthguards are those that are bought from local sporting goods stores. Although these mouthguards may provide short-term protection, they usually wear down and loosen their grip over time. Even the very best over the counter product cannot insure quality and effectiveness. The best mouthguard (based on research evidence) is one designed by a dental professional, like the dentists at Longmeadow Family Dental Care. Our dentists will assess your athlete’s individual needs to build a custom mouthguard that will protect their teeth and mouth from injury. An initial pre-screening will take into account the age of the athlete, their teeth and jaw structure, and the type of sport they play, so we can construct the perfect custom mouthguard for your child. What are Custom Mouthguards Made Of? Custom mouthguards are made from precise models of an individual’s own teeth. They are constructed with resilient and tear resistant materials, ensuring a proper fit. The mouthguards are comfortable, easy to clean, and do not restrict your athlete’s ability to breathe. Sports-related dental injuries account for more than 600,000 emergency room visits each year. Custom mouthguards protect the entire oral region from traumatic injury, preserving your child’s health and beautiful smile. To ensure mouth protection for your athlete, schedule an appointment for a custom fitting mouthguard with your Longmeadow dentist today. Refers to pressed, fired, polished or milled materials containing predominantly inorganic refractory compounds including porcelains, glasses, ceramics and glass-ceramics.